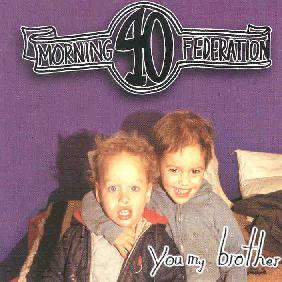 Morning 40 Federation - "Your My Brother"
My introduction to Morning 40 Federation was a few tracks on the "Tekito Split Volume 1" reviewed in AI #10. In that review I described the band as sounding like Motorhead produced by Vas Deferens Organization. On their debut full-length we don't hear the synths I referred to in the earlier review though VDO's Matt Castille is still producer, though for him this is pretty restrained. However, when I say restrained for Castille that is by NO means to say Morning 40 Federation is restrained. Far from it. On their web site I saw the term "sleazy burlesque" in reference to their music and that's such an apt description I'll use it myself. Instrumentation includes guitar, bass, drums, sax, trombone, piano, banjo, and vocals. The band's sound is raw and dirty. It's bluesy, but often avant-bluesy in a Captain Beefheart way or like some of the bluesier music Snakefinger used to play. I really like guitarist Ryan Scully's style, which helps keep the music in freaky land and gives it an appeal that many AI readers would like. He's not a flashy player but each note is distinct, sometimes having a piercing sting and at others having a fuzzed quality that sets itself apart from the rest of the band but fits in so well. He can also just plain rock out! There's a lot of variety on Your My Brother. From the swingin' feel of "Itsy Bitsy Brother" to the punked out sonic chaos of "Gotta Nickel". "Chili Cheese Fries" has very cool stinging licks and is even a bit metallic, but it's peppered with abrupt start/stop rhythms, organ, and zany vocals. "Ninth Ward" has a cool beat feel that reminds me of some of Snakefinger's Manuel Of Errors album and includes some gorgous wah'd fuzz guitar. "That Ain't Professional" starts off as a slow blues tune but gets pretty intense at the end featuring some Zappa-like guitar and general frenzy from the entire band. In summary, Your My Brother is a fine set of good-time tunes that would appeal to fans of blues that fall outside the mainstream including touches of the avant-garde and general freakiness. I'm sure Morning 40 Federation would be a blast seen live. Preferably in a smoky dive with lots of dirty glasses. For more information on Morning 40 Federation and other very cool Tekito bands you can visit the Tekito web site. Contact via snail at Tekito Communications; PMB #432; 828 Royal St; New Orleans, LA 70116.